Floriss Group — Malik Media | Branding. Marketing Strategy. Design. Each page contains a call-to-action above the footer. When the action is taken, a form opens allowing users to request a private call with the CEO of the firm. Upon submission of the form, contact information is stored and imported into a designated list. The user receives an immediate, automated email prompting them to confirm their phone call by selecting a time. Upon clicking the "Select a Date" button in Step 3, the user is taken directly to the Calendly profile, allowing them to book a call directly into the CEO's calendar and obtain a dial-in number to a private conference line with the CEO. The results page showcases six case studies for users to download. Users can download case studies in exchange for their email address. The six case studies are each tailored to a specific industry, so when a user downloads one, their email address is automatically imported into an email list segmented by industry. After the user completes the form from Step 3, which imports their email into a designated list , an automated email sequence is triggered. The first email in this sequence (displayed above) contains the requested case study for them to immediately download. Segmented lead capture: It allows the client to capture contact information with an associated industry, providing context into the lead’s interest and what services they may be interested in. 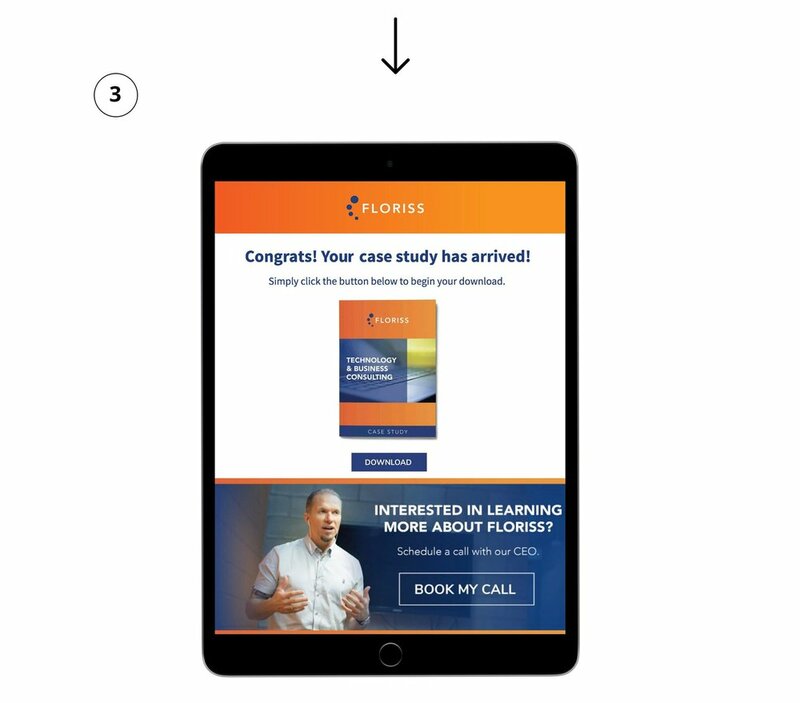 Opportunity to ask for more: Delivering the content via email gives the client extra real estate to push leads to take another action; in this case, a banner has been added to the footer, prompting the lead to schedule a call with the firm’s CEO. Automated lead nurturing: The email that contains the PDF is only the first email in an automated sequence that could be expanded into an entire nurture campaign. For example, if a user requests a case study for the Technology & Business Consulting industry, after they receive the case study, the client can send additional automated emails to the user, dripping them with content specific to Technology & Business Consulting (e.g. other case studies, free sales advice for that industry, or even testimonials from clients in this field). T his completely automated feature turns a website into a lead generation machine. Capturing contact information in exchange for a content download effectively feeds users into the first step of their sales funnel, and nurturing them with relative content allows the client to build trust and interest, eventually prompting them to take action. 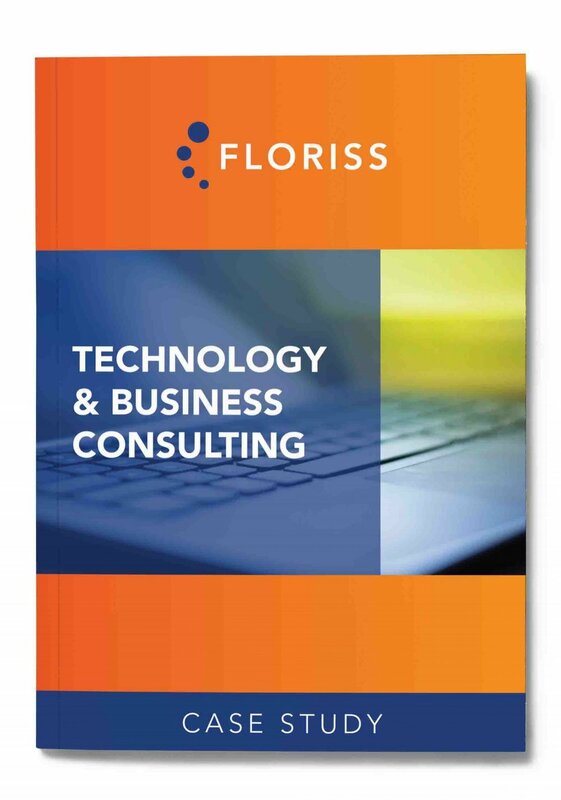 Floriss Group is a U.S.–based, global sales consulting firm that serves a wide variety of modern Technology and B2B sales teams. Floriss engaged our team after spending several months carrying out an internal audit of their brand position and developing an in-depth analysis of their competitive environment. They needed help in both crafting and executing on a marketing activation strategy to position their brand for the next decade. From their research, they pinpointed a need for a revamped visual identity that reflected the unique energy and personality of their organization. They also saw a need for the implementation of technology to streamline the delivery of training resources to their clients aid in lead generation. Our engagement began with multiple group sessions / calls in which our team asked a series of analytical questions designed to uncover the essence of Floriss as an organization. From our research, we gathered that the people, the positive energy, and the trust are what separate Floriss from competing firms. Hence, we built a visual identity for Floriss that was reflective of these traits in every element from our color palette to the photographs we staged. While creating a development plan for Floriss' new website, we started by pointing out the weaknesses in their previous site. In particular, their prior site lacked technical efficiency. The site only had one contact form, for which none of the responses aggregated into a central lead database. Moreover, they had no simple way to deliver free resources or paid training content to prospective customers and paying clients alike; instead, they were individually sending these materials to hundreds of people via manual email. 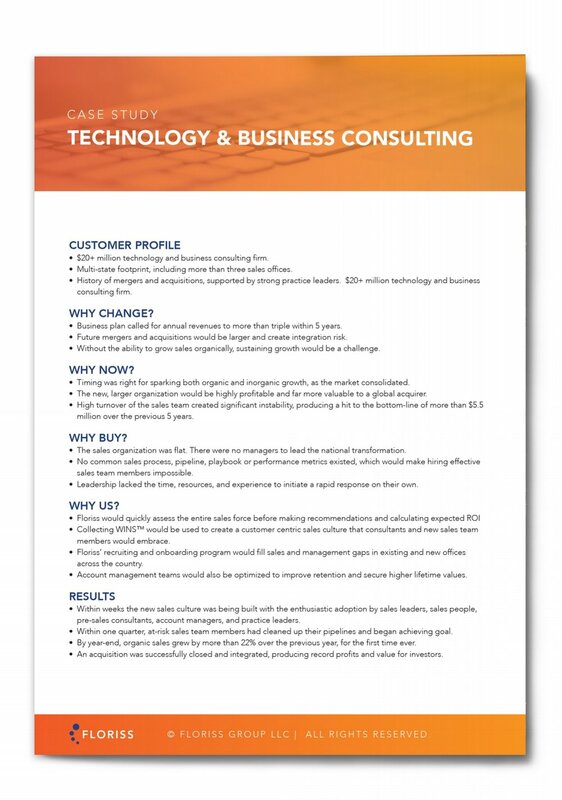 Using these weaknesses as opportunities to create competitive advantage, we built numerous inbound lead capture forms, using email automation to give away free white papers and assessments to clients in exchange for their contact information, which gets fed into a database separating leads by industry. We also built out a fully-functional client training portal using the Wishlist Member software, allowing Floriss to protect their intellectual property and deliver it in a safe and efficient manner that is easy for their clients to use. We engaged Malik Media to complete our corporate rebranding with a modern and interactive website. They immediately stood apart from the competition by demonstrating a sincere interest in understanding our goals and ensuring each deliverable provided the impact we expected. Sam and his team are passionate about what they do, patient and thoughtful about how they communicate, and highly effective and efficient with their time.